For racing sailors young and old, inexperienced or experienced, a protest hearing can mean fear, anxiety apprehension, anger and humiliation. And that’s assuming the decision went your way! For the “losers,” the feelings are even worse. For these reasons and more, most of us avoid protest situations at all costs. Participating in the protest process need not be a negative experience. The goal for all involved should be to have it be a positive and educational experience. It is an important way for us to demonstrate our love of the sport of sailing and our respect for our fellow competitors. 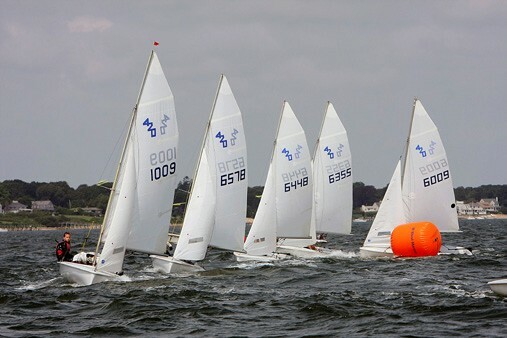 At our recent Invitational Regatta, hosted by Pequot Yacht Club in Southport, CT in four classes (C420, Laser Radial, Pixel and Feva) for intermediate sailors age 11-15, an effort was made to open up and demystify the protest process for young sailors by holding open protest hearings. We invited sailors into the hearings as observers to witness all aspects, including the normally private committee deliberations. What follows is our roadmap for making it happen, and some dos and don’ts to keep in mind if you are going to make it succeed. Effective open protest hearings begin with selecting the right committee. Pequot is fortunate in that we count among our membership sailors with strong racing backgrounds, strong knowledge of the rules and a high comfort zone for communication. For our protest committee, we were fortunate to recruit David Dellenbaugh (tactician and starting helmsman on America3, the successful 1992 America’s Cup defender, as well as three-time U.S. Match Racing Champion), David Storrs (currently the #1 ranked match racer in the U.S. based on the ISAF Open Rankings), and Max Simmonds (Pequot’s C420 coach and a member of the Boston College Sailing Team) to be on the strong committee needed to make open protest hearings work. Not lost on us was the need for a strong chair. For open hearings we would need someone not just strong on the rules and strong on communication, but also comfortable as an educator. Dave Perry (past Rules Advisor for the U.S. Olympic Sailing Team and several America’s Cup teams, and four-time U.S. Match Racing Champion) fit the bill perfectly. We determined that the ideal space for open protest hearings would be a large room that could be configured as a classroom, with the protest committee positioned up front with a magnetic board (to display boats) visible to all to diagram protest situations. Ample seating was necessary to accommodate an audience. Such a space needed to be “away from the action” and relatively quiet so that everyone could more easily focus on what would be going on in the room. With the committee members recruited and the space prepared, we awaited protests (there were six) and, once the sailors were back on shore and boats almost put away, we announced that open protest hearings were about to begin and all were cordially welcome to attend. Although protest hearings would be open, arbitration hearings would remain closed as the very nature of arbitration lends itself to an informal and confidential process. The committee would conduct fully open protest hearings, meaning that all in attendance would be listening in not just on the witness presentations, but the deliberations by the protest committee members as well. If a sailor was to be a witness in a protest, he or she could not be present in the hearing room until/unless he or she was called. Once anyone was in the room for any part of the hearing, he or she had to stay in until the end of the hearing. This is done to prevent communications with witnesses, who were not present. Sailors needed to be respectful and not be talking or texting during the hearings. Was It a Success? Yes! Six protests were heard in front of many of our young sailors. In spite of the open setting, the hearings went off without a hitch. And the issues were sufficiently complex that, upon conclusion, important lessons were learned not just by the protesters, witnesses and the audience, but by our rules-savvy protest committee members as well. And…the ultimate litmus test….many sailors remained in the audience, attending the last of the hearings while the dinner and dance had begun!